This comprehensive volume ranges across the entire spectrum of contemporary sociological inquiry, as seen by Durkheim. It also includes secondary readings by social thinkers of today, connecting the classic writings of Durkheim to contemporary issues. Mustafa Emirbayer is Associate Professor of Sociology at the University of Wisconsin-Madison. He has written widely on Durkheim and on classical and contemporary social theory. 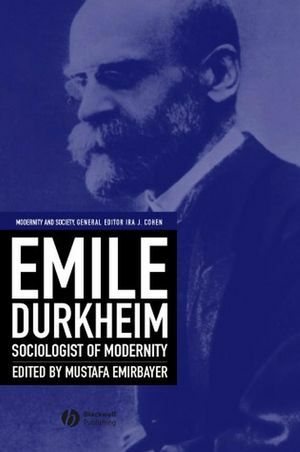 Emile Durkheim: Sociologist of Modernity. 1. An Agenda for Sociology. Distinction: A Social Critique of the Judgment of Taste. Part II: A Topography of Modernity. 2. Social Structure and Collective Consciousness. The Division of Labor in Society. Open Schools – Open Society?. 3. Culture and Symbolic Classification. The Elementary Forms of Religious Life. The Royal Touch: Sacred Monarchy and Scrofula in England and France. Purity and Danger: An Analysis of the Concepts of Pollution and Taboo. Wayward Puritans: A Study in the Sociology of Deviance. 4. Collection Emotions and Ritual Process. Essays on Morals and Education. The Ritual Process: Structure and Anti-Structure. The Nature of Deference and Demeanor. Stratification, Emotional Energy, and Transient Emotions. Historical Events as Transformations of Structures: Inventing Revolution at the Bastille. 5. Individual and Collective Agency. The Evolution of Educational Thought. Culture and Political Crisis: “Watergate” and Durkheimian Sociology. Part III: The Institutional Order of Modern Societies. Professional Ethics and Civic Morals. Selections from the Prison Notebooks. The Moral Economy of the Peasant: Rebellion and Subsistence in Southeast Asia. The Moral Dimension: Toward a New Economics. 8. Civil Society (1): Occupational Groups and Family. To Empower People: From State to Civil Society. Peter L. Berger and Richard John Neuhaus. 9. Civil Society (2): Education. The School Class as a Social System: Some of Its Functions in American Society. Teaching to Transgress: Education as the Practice of Freedom: bell hooks. Part IV: Morality and Modernity. Pricing the Priceless Child: The Changing Social Value of Children. The Rules of Sociological Method.